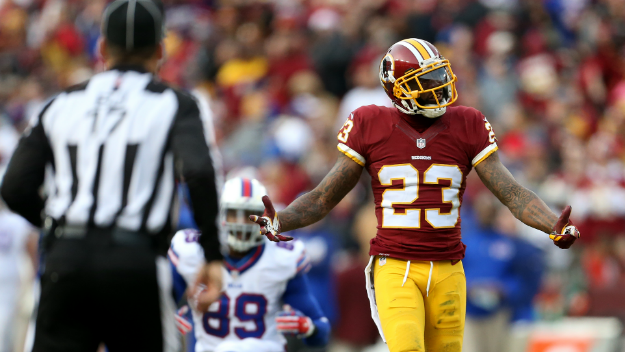 According to ESPN’s John Kiem, Washington Redskins safety DeAngelo Hall and linebacker Houston Bates will open training camp on the physically unable to perform (PUP) list. Neither case should come as a surprise to anyone who has followed the Redskins injury situation over the past year. Both players are recovering from ACL injuries; Hall went down in September of last season while Bates had his injury in December. The Redskins appear to be deep at both positions Hall and Bates play, which gives the team some leeway to determine the true extent of each players injury and where they stand heading into the preseason. Hall is expected to serve as a backup to newly acquired D.J. Swearinger and linebacker-turned-safety Su’a Cravens. Bates, who has served as a quality backup and special teams player in the past, is currently facing stiff competition from rookie Ryan Anderson this summer. Neither injured player is guaranteed a spot on the final 53-man roster, meaning these two guys need to get back on the field as soon as possible. For Hall, the questions about his health are becoming an every year thing now. The veteran defensive back has only played in 17 games over the past three years, starting 13, and took a two million pay cut earlier this year and once cleared, could save the Redskins another $2.3 million in salary cap space. The Redskins will likely wait until the team gets a chance to put all their players through physicals on Wednesday before they release an official injury report or add any other players to the PUP.